Researchers at Stanford University have found a way to help reduce the cost of catalysts used inside fuel cells. 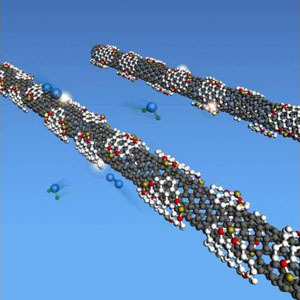 By using multi-walled carbon nanotubes riddled with defects and impurities on the outside, the scientists believe they may be able to eventually replace some of the expensive platinum catalysts used in fuel cells and metal-air batteries. The researchers recently sent samples of the experimental nanotube catalysts to fuel cell experts for testing. “Our goal is to produce a fuel cell with very high energy density that can last very long,” Li said. 1 Comment on "Multi-Walled Carbon Nanotubes May Eventually Replace Expensive Platinum Catalysts"
Good to see that platinum catalyst is replaced by MWNT.